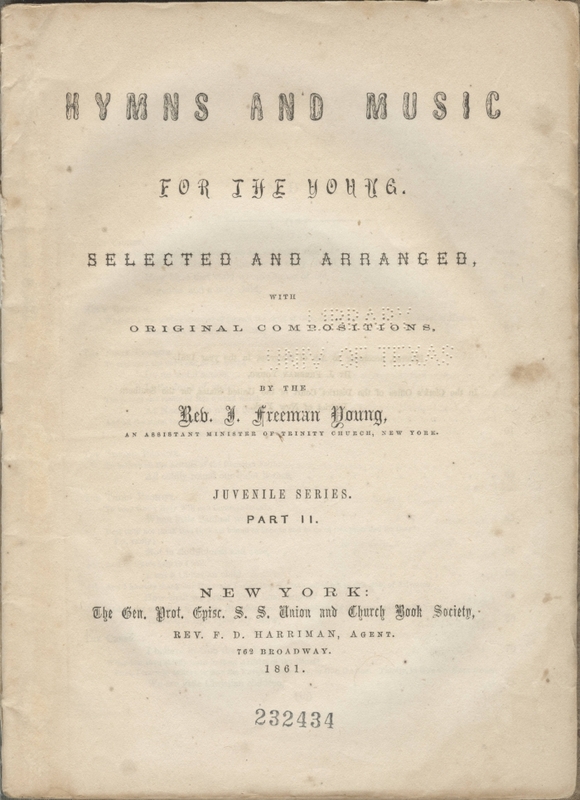 THE occasion of this Collection of Hymns and Music for Children was the want felt by its Author of something of the kind in the prosecution of his labors in the schools of St. John’s Chapel His plan has been, in classifying and arranging the better portion of such materials as, with no little effort and care, he has been able to collect, to follow the order of the development of the infant mind. 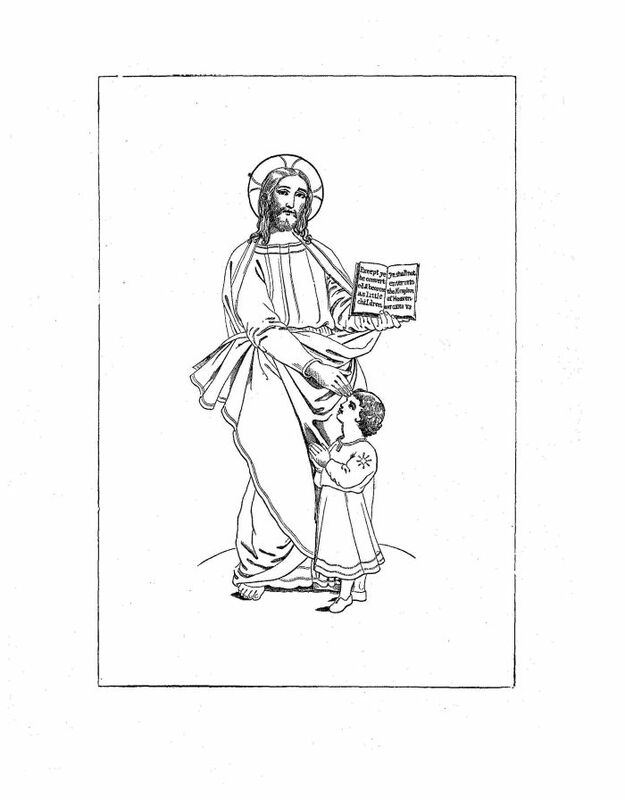 Beginning with Morning and Evening Hymns of Prayer and Praise, which are usually the first things taught to the little Christian Child, the order of the Series proceeds next to Home and its Relations, and then on to the Revelation of God through Nature — our Lord’s gracious Bidding that the Little Children should be brought unto Him — their being thus brought and devoted to Him in Holy Baptism — and the Duties and Obligations arising out of these new relations: the order of the Church Catechism being here exactly followed. Several Hymns and Carols for each of the principal Festival and Penitential Seasons of the Church Year, with a few Miscellaneous pieces, complete this Juvenile Series. In the preparation of this work, the first aim has been to avoid original, as far as possible, in both the poetry and music; and the second has been, not to alter, except in unavoidable cases, the productions of others: notwithstanding, it has been found necessary to amend frequently, and sometimes to substitute whole verses, as respects the Hymns; while most of the Melodies have been harmonized, and not a few composed. In the musical part, Mr. J. Mosenthal and Mr. H. R. Schroeder, both of eminent attainments in the musical profession, have very kindly lent their aid, not only in composing many pieces, but in newly harmonizing, or revising, the greater part of the music given. To meet more precisely the wants of different portions of the community, the work is issued not only as a whole, but likewise in three separate parts: — Part First, containing the Hymns relating to Morning and Evening, Home and its Relations, and the Revelation of God through Nature: — Part Second, containing those relating to Holy Baptism, the Duties arising out of the Christian Covenant, and the Child’s Church Year: — Part Third, containing the Miscellaneous Hymns and Songs. The several parts are about equal as to both quality and quantity, and are independent of each other, while taken together they form a varied and comprehensive Series of Hymns for Little Children. NEW YORK, December 12th, 1859. 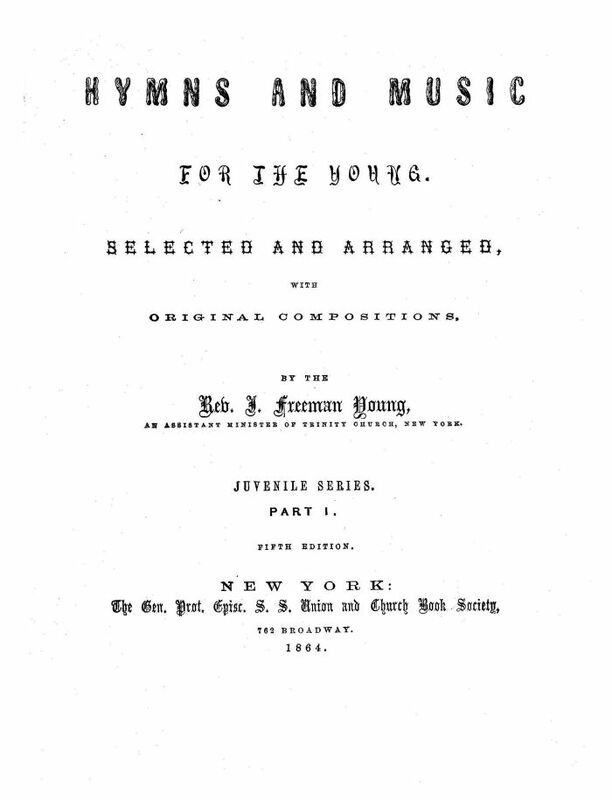 A PDF of the scan of the entire volume: Hymns_and_Music For The Young - Part First (1860) (4,284 KB). The second part contained no introduction or preface by the editor. No page gave acknowledgement to either the author of the lyrics or the composer of the music. The structure was that of a musical catechism for children. Note that the last numbered hymn in Part First was No. 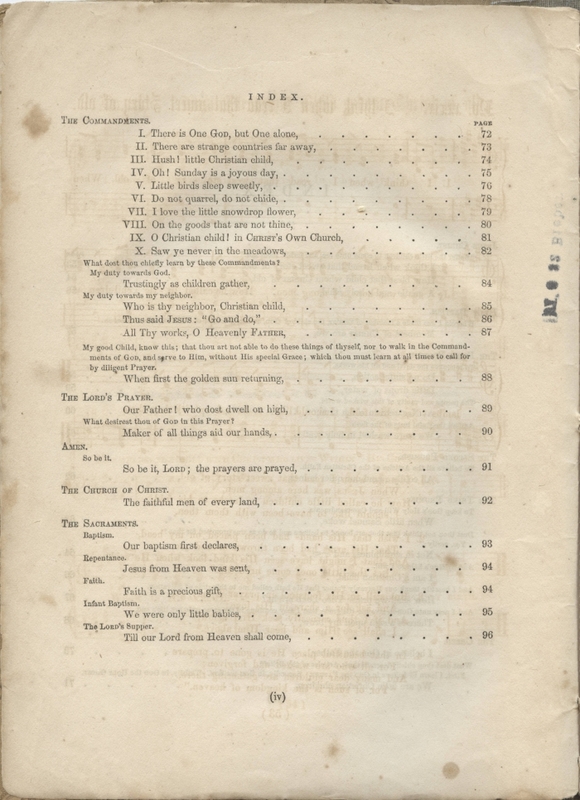 37, while the first hymn in Part Second was No. 39. As I obtained Part First on inter-library loan, I am unable to examine the text to determine whether there were pages missing; there was no index in the volume I received. I examined Part Second and determined that, as best as I could tell, it was complete. 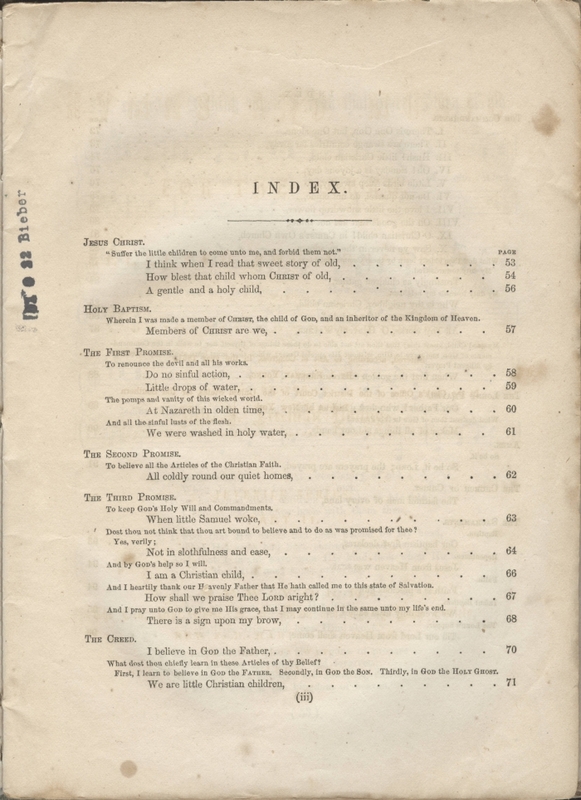 This listing of the contents is from the Index pages; see below for scans of these two pages. 51. How Shall We Praise Thee Lord Aright? 67. Thus Said Jesus: "Go And Do"
The index to Part Second. The cover on the copy Part First I obtained on interlibrary loan was not the original; rather, it was a manila file folder — cut, folded, and glued — with the title and editor's name printed on the face. This volume consists of 48 pages and 36 hymns and carols. Neither the name of the lyricist nor the name of the composer or arranger is found with the text of any hymn or carol. There was no index of lyricist, composer, or arranger. This was evidently a popular publication since it was in its fifth edition in as many years. Part Second consists of 48 pages and 40 hymns, and was first published in 1861. In this edition, there was no introduction or preface. Neither the name of the lyricist nor the name of the composer or arranger is found with the text of any hymn or carol. Part Second is designed to be a musical catechism for children (see the scans of the index, above). Part Third ("containing the Miscellaneous Hymns and Songs") was referred to in the Preface to Part First (above) and in other publications. However, there is no evidence that it was ever published. Part Third is believed to have contained Young's great translation: Silent Night, Holy Night. As we have seen, however, first publication of that carol occurred at least as early as 1859 in Carols For Christmas Tide. Young (above) wrote that "The several parts are about equal as to both quality and quantity." As such, the missing Part Third should have contained about three dozen "Hymns and Carols for each of the principal Festival and Penitential Seasons of the Church Year, with a few Miscellaneous pieces." I received an interlibrary loan of Great Hymns of the Church the third week of January 2007; this was the volume edited by Rev. John J. Hopkins, Jr. in 1887, and was said to be the complete publication of Young's collection of hymns. According to Rev. Hopkins, a few days before his death Bishop Young "expressed the desire that, should he leave the work incomplete, it should be put into my hands to see through the press." It was published two years after the death of the Bishop. Aside from a few notes to the hymns themselves, there was only Rev. Hopkins' Preface. Unfortunately, there was no mention of either Carols For Christmas Tide (1859) or Hymns and Music For the Young, either Part First (1860) or Part Second (1861). There was no Introduction or Preface prepared by the Bishop for this volume. 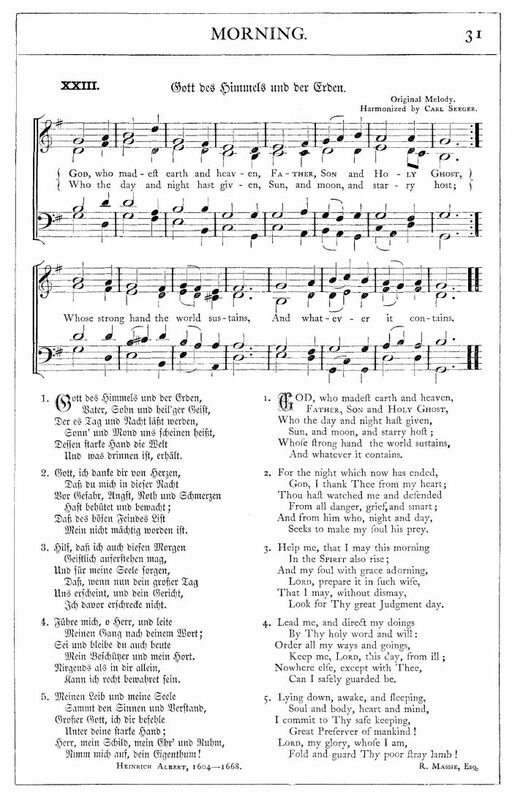 Of Hymns and Music for the Young, Part First, only one of the 36 was republished in the Christmas-tide sections of Great Hymns of the Church: "God Who Madest Heaven And Earth" (Translation by R. Massie: see left for scan). No hymns from Part Second were located in the Christmas-tide sections of Great Hymns. The one constant of all these three hymns published in Great Hymns of the Church is that all three are translated from either German (Silent Night and God Who Madest) or Latin (Royal Day). Indeed, of the 290 hymns in Great Hymns Of The Church, only eight1 were not translations from German, Latin or Greek. None of those related to the Christmas-tide. Based on this information, I am not confident that any significant portion of the unpublished Hymns and Music for the Young, Part Three will be recovered, unless they can be found in the papers of Bishop Young or Rev. Hopkins, if any. Joyful Light, Hopkins, p. 6. O Jesu, My Saviour, Hopkins, p. 187. The Day of Resurrection, Neale, p. 196. Come, Ye Faithful, Neale, p. 212. Praise To The Father, Hopkins, p. 258. High Tower And Stronghold Is Our God, Hopkins, pp. 314-5. Cease Ye Tearful Mourners, Caswell, p. 444. I had previously been under the mistaken impression that Bishop Young had been the author of the hymn "Wonderful Night." However, in Great Hymns of the Church (J. H. Hopkins, ed., New York: James Pott & Co., 1887), credit for the lyrics is given to Dr. Joh. Frederick Meyer (1772-1848); the translation was provided by the Rev. Milo Mahan, D. D.; the tune "Christmas Eve" was composed by Dr. Conrad Kocher. I apologize for the error.